Are there mushrooms in Antarctica? What kinds of fungi grow on deer dung? What would happen to me if I ate Amanita muscaria? What have mushrooms got to do with Santa Claus? 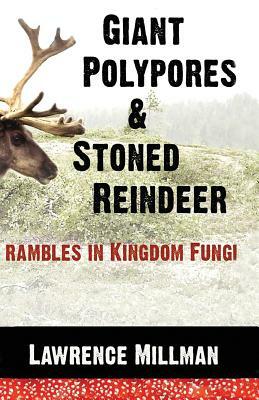 All these questions, and many others you would not have guessed to ask, are answered in Giant Polypores and Stoned Reindeer: Rambles in Kingdom Fungi. Mycologist, author, traveler and raconteur, Lawrence Millman has brought together two dozen fascinating myco-tales of encounters with a wide range or organisms from extinct polypores, fungi that start fires and cure wounds, to intoxicated reindeer, wild mushroom collectors and Bornean head hunters. Giant Polypores is a fungophilic ramble from the Antarctic to Honduras to Iceland, searching for new and rare taxons, unusual characters and strange encounters. If you are enamored with such Latin binomials as Ganoderma applanatum, Gymnopilus spectabilis, Inonotus obliquus or Radulomyces copelandii you will love Giant Polypores and Stoned Reindeer. If terms such as resupinate fruiting body, cystidia, hymenium or glaborous make your heart beat just a bit faster, then, as mycologist emeritus, Elio Schaechter said, "I dare you to put this book down once you open it."